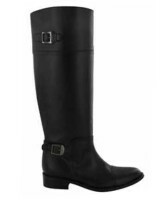 These tribal vegan boots may initially appear to be squarely in the tribal / hippie department but their somewhat 80s styling (they’re actually referred to as “retro” by the seller) does have a certain air of hipsterism you can use to your advantage. 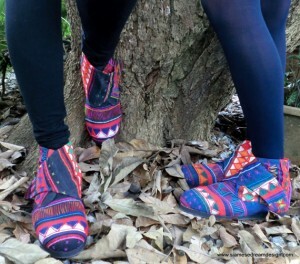 They come from Thailand and are made out of tribal fabrics by an enterprise working to empower local tribal women. 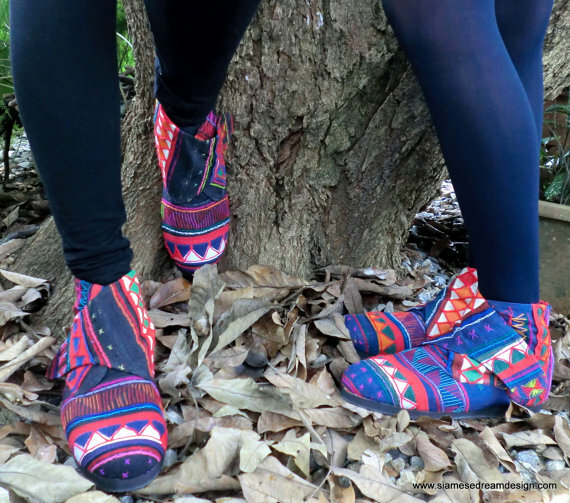 These particular boots are made out of fabrics made by Akha tribal women, but the Etsy shop where I found them features stuff made from fabrics spun by the Hmong tribe as well. There are all kinds of vegan shoes, sandals and boots (including knee highs) in all kinds of mad colours. As with all stuff made out of tribal style arts, you can wear it full hippie with the whole harem trousers or sarong fabric dress thing or you could match it with more urban, classic stuff to just give a touch of hippie. Either way, I’m loving the black version. 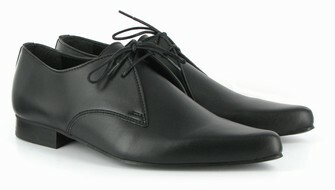 Oh and they also do some shoes for men and some of them are quite unusual. I like these. Check out the stuff in the Etsy shop. What a great site! Thanks so much for showing off our retro Cyndies.